Block Island, R.I. bottom fishing is the best it’s ever been. Catching a mixture of jumbo fluke, sea bass and striped bass. We have been limiting out on sea bass. 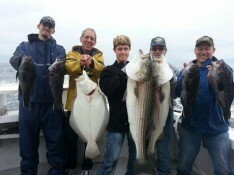 Old Salt sport fishing charters fishes Rhode Island Block Island sound waters. We sail from Galilee, R.I. We fish for stripers, blues, tautog, black fish, porgy, sea bass and cod. Rhode Island offers some of the best fishing in the world. Join us today for the fishing experience of a lifetime. Book now and come have some fun.